Starry nights are an especially fantastic experience in a roadster. Being able to have a full line of sight with the roof removed, fresh air and a warm night are the making of good times. 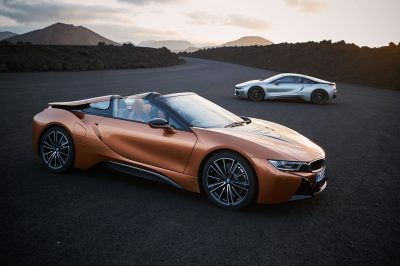 One special star on the rise is the brilliant BMW i8; and now with the addition of the exciting new i8 Roadster, these are the days of new beginnings for BMW. A fast, brand new BMW i8 Roadster with all the up-to-speed equipment in EV form has to get the pulse racing. If that doesn’t do it for you, then just take a look at the beautifully crafted low-profile lines that are a direct link to the legendary BMW M1 of the late 70s early 80s. Actually, if the truth be known, BMW have been looking for the right car to replace the very special M1 – and it’s taken some time to get the right mix. After many concepts fell by the way, in 2013 the Vision EfficientDynamics concept led to the design, build and production of the BMW i8 – as we know it today. The Vision EfficientDynamics concept had in mind a plug-in hybrid with a three cylinder turbo-diesel engine. The new BMW i8, which began production in early 2014, was designed by Benoit Jacob. It is the first mass-produced mid-engined BMW since the M1. The i8 is a very exciting car to drive, and in Roadster form it’s quite something! 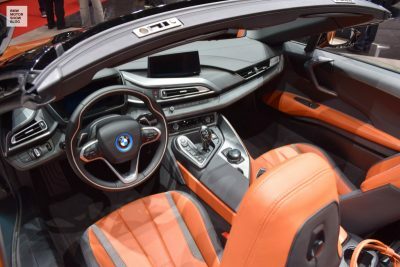 Offering just the 2 seats, the BMW i8 Roadster has an electric 2-piece roof that very neatly folds into the space where the rear seats would normally be in the Coupe version. Styling is slick, and extremely aerodynamic. Boasting gull-wing doors and a very low centre of gravity, you really do step down into the leather sports seats which are bucket shaped and meant for business as well pleasure. Inside the interior of the new i8 is a very tidily put together cabin with gorgeous leather, all the mod cons and superb ergonomics. You have a great low—down driving experience that offers the driver the comfort of superior handling and dynamics. The door panels and door inserts are premium leather, while the door sill strips have their very own laser-printed inscription of the ‘i8’ logo. There are nice velour floor mats, and the instrument panel is offered in a selection of colours of natural leather trim. You do have a choice of colour selections to make your new i8 Roadster a unique and rare machine. Standard features keep the new BMW i8 Roadster a premium hot commodity with plenty of technology fitted inside the coachwork. The BMW central display screen features a 10.25 -inch HD LCD colour display with a touch control panel. This BMW remote key has a display option that connects to the vehicle status information which shows things like the charging status and range, service information, vehicle locking and more. On-board the new i8 Roadster you can make your phone calls while driving with hands-free technology and voice control. Smartphone connectivity includes the ability of the car’s infotainment system to wirelessly connect and charge your smartphone. Audio streaming is a nice touch so that you can listen to your own favourite tracks seamlessly. The i8’s are equipped with the latest harman/kardon surround sound systems with 11 speakers and DAB+ digital radio. With a whopping 20GB storage for audio files, USB audio interface, MP3 player compatability, Apple iPod or USB satellite navigation you have some serious techno clout. Two-zone automatic air conditioning keeps the cabin comfortable, and there are cupholders should you require on-board refreshments. A power socket for 12 V electronics and useful storage compartments make the i8 Roadster surprisingly useful at tucking things away for the journey. Seating has electronic adjustment and heating functions for both the driver and front seat occupant. Out on the road at night you’ll appreciate the i8’s very good LED headlights which also boast a cornering function. The Roadster comes standard with stylish DRLs. On the safety front the sporty little i8 Roadster comes with rain sensors, automatic headlight activation, cruise control with a braking function, current speed limit information, high-beam assist, pedestrian warning, a city braking function from 10 – 60 km/h, Head-Up Display, Park Distance Control (PDC) and airbags to protect occupants from the front and side. The i8’s quiet travel is amazing for occupants, but if the car were not equipped with acoustic protection for pedestrians then life would be hazardous for other road users. The artificially generated sound when driving electrically up to 30 km/h helps to protect other road users. An integrated roll-over sensor and battery switch-off function ensures the car remains a safe safety cell for occupants in the event of a serious accident. All the active safety features are standard, and these include: Dynamic Stability Control (DSC), an Antilock braking system (ABS), Brake Assist and Cornering Brake Control (CBC). You even get a warning triangle and first aid kit as part of the i8 package. As the driver of the racy i8 Roadster, you’ll enjoy the cockpit. The instrument cluster has a very clear 8.8-inch high-resolution colour display to keep you in touch and informed with your drive. The 3D map for satellite navigation looks awesome and it offers an arrow display, as-well-as bird’s-eye view. Exciting performance is a must when the Roadster looks this good. To match the hot looks of the new i8 Roadster BMW does not disappoint with the i8’s performance, so you’ll find a total of 266 kW available, with a full 570 Nm of torque. This power is instant and hugely fun. BMW claim that the i8 will take a little over 4 seconds to sprint from a standstill to 100 km/h. The total power comes from a hybrid synchronous electric motor with 96 kW and 250 Nm. The electric motor runs a 2-speed transmission that drives the front wheels. The rest of the power comes from the very special little BMW TwinPower Turbo 3-cylinder petrol engine which is a 1.5-litre motor with 170 kW and 320 Nm of torque. Via a six-speed automatic transmission, the petrol motor drives the rear wheels. Depending on the driver’s right foot behaviour, the AWD BMW i8 Roadster can run for up to 600 km before refuelling and recharging needs to occur. Charging the batteries takes 1 hour 45 mins to 80%. The battery has an 8 year/100,000km warranty. A lot of love goes out for the i8 Roadster’s hot and dynamic looks. BMW has used aluminium for the bonnet and door construction. The passenger shell boasts carbon-fibre reinforced plastic. These features help to keep the car’s weight as low as possible. I can’t speak enough of how cool the car looks; and you can even show off the design on a selection of wide 20-inch rims. It ain’t cheap but do go and get yourself one of the coolest cars currently on the road. 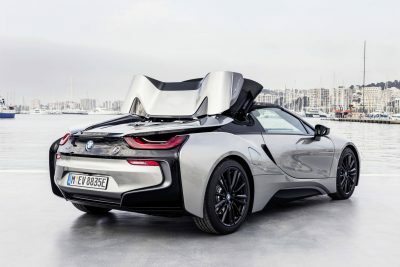 BMW i8 Roadster – the roof tucks neatly away behind the cabin space. 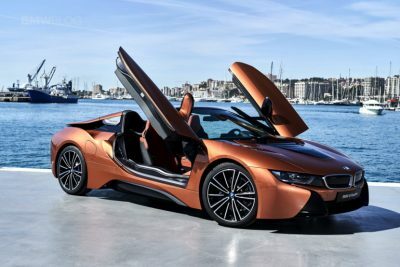 For any more information on the 2018 BMW i8 Roadster or, for that matter, any other new car, contact one of our friendly consultants on 1300 303 181. If you’d like some fleet discount pricing (yes even for private buyers! ), we can submit vehicle quote requests out to our national network of BMW dealers and come back with pricing within 24 hours. Private Fleet – car buying made easy!